LiveMotion, Adobe’s answer to Flash, was not impressive in its debut. 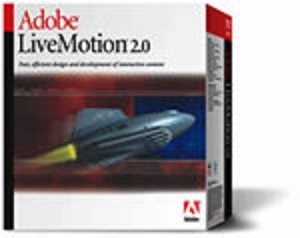 While Adobe’s products have the advantage of better interface design, LiveMotion 1 lacked the power and capabilities to truly compete with Flash. While that still may be somewhat true, LiveMotion 2 has come quite a long way in adding serious features that will appeal to Web designers and animators. The interface is generally very clean and easy to use, and looks especially good in its implementation for Mac OS X. But there are some glaring omissions. Want to draw or paint a freehand object? Too bad there is no tool for that! Drawing is limited to beziers with the vector pen and shape tools. If you want anything more than that, it must be created in an outside application. One thing I don’t really understand about the interface is the Color Scheme palette. As far as I know, this feature is not shared with any other Adobe application, so I’m not sure why it’s there. I don’t find it especially useful or intuitive. Why LiveMotion has this, and not a Web-safe color palette, is beyond me. There is no doubt that the greatest strength of LiveMotion is its timeline, which is based upon the Adobe After Effects timeline. There are no block frames to hassle with. The timeline is based on seconds, so it’s more intuitive to use than the Flash timeline. Animating an object is as simple as moving to the desired time and altering an object’s position, etc. This is much better than Flash’s frame/keyframe method. Want to shift an animation forward or back in time a bit? Just drag your keyframes on the timeline. LiveMotion 2’s timeline is even closer to the one used in After Effects, which is probably the best timeline design out there. In addition to providing a clearer picture of how things occur over time, it’s very easy to see at a glance how the attributes of your objects are changing. You don’t have to dig into palettes nearly as much as you do in Flash. Some keyboard shortcuts are carried over from After Effects for quick timeline navigation, as are “hide,” “shy” and “lock” controls. Also, you can use the timeline to scrub through your animation to quickly preview how your animation works. Future versions could benefit with the addition of more features from the After Effects timeline. For example, putting attribute and transform value controls directly on the timeline would be a great timesaver. It can be confusing sometimes to find the appropriate control in the palettes. Livemotion 2 really plays on tight integration with other Adobe applications. You can now import nested Photoshop or Illustrator layer sets, then convert to objects or sequences. Impressively, if you update your source file, the changes will be reflected in your LiveMotion document. While Flash MX boasts that it works well with Illustrator files, I still run into plenty of headaches and glitches. Half the time, if I want to use an Illustrator file in Flash, I find myself exporting an SWF file. Conversely, LiveMotion 2 did not handle Freehand files very well in my tests. One of the greatest drawbacks of LiveMotion is its inability to import SWF files into a composition, even SWF’s created by LiveMotion. You can point to and bring up outside SWF files in the final playback of your composition via the “Load Movie” behavior, but you can’t edit them in LiveMotion. Flash allows you to import SWF files and even edit the objects. If you need to have access for editing SWF files, then LiveMotion 2 will not fulfill your needs. What LiveMotion does seem to do somewhat better than Flash is deal with bitmap animation. Playback seems to be smoother and file sizes are just a bit smaller. LiveMotion’s control of transparency and other bitmap attributes are also easier to control than in Flash. But I’m not so sure about the bitmap effects that Adobe brags about. These quickly jack up the file size and slow down animation playback. Another great feature is the ability to save animations as “styles” in the Styles palette, then apply the same motion to other objects. This is a godsend for those who have to do repetitive tasks during production, and sort of reminds me of the Swift 3D animation presets. Impressively, each animation style can encompass several changes to an object. The Script Editor is well laid out, and choosing an item from the left pane will bring up a short explanation of that item in the bottom pane. Unfortunately for code novices, this editor assumes that users have a good foundation in Actionscript. It would be nice to see Adobe implement a novice mode and code hinting, as Macromedia does in Flash. Thankfully, the included Scripting Guide book is easy to read and understand. Still, it’s better to have some live software assistance than to have to refer back to the book constantly. Another interesting new feature are the Live Tabs, which give the user the power to add to LiveMotion’s interface by building custom controls. These work with LiveMotion’s automation scripts, and can control anything from creating graphics, generating keyframes, or modifying Actionscript commands. This will be extremely useful for designers who need to customize the application to suit their workflow for complicated projects. Livemotion 2 also brings with it some output enhancements. You can now export as a streaming Quicktime movie, which is the best format for making use of the bitmap effects and distortions. Eight-bit alpha channel support means you can mix this footage with video and other LiveMotion movies in a video application like After Effects. Adobe claims that this output is smooth and easily avoids bitmap artifacts normally associated with Quicktime output from SWF applications. I found this to be true in my tests, and was impressed by how much better the result was from a LiveMotion-generated MOV file than one created in Flash. Of course, LiveMotion 2 does not support an Import feature for video streams, so if you need to deliver video through the Flash plugin, then you will need Flash MX or Wildform Flix. After Effects users will be interested to know that LiveMotion 2 can import After Effects 5.5 animations. This opens up amazing possibilities, and puts great features like “parenting” in your hands that would otherwise be very complex scripting tasks. While After Effects can export SWF files, it does not give you the amazing level of interactivity that Actionscipt affords. Using the two programs cooperatively is quite a powerful combination. The audio controls in LiveMotion are decent, but they could be better. I was a bit confused about how to control panning and volume changes until I stumbled upon the appropriate sliders in the Properties palette. I’d like to see controls right on the timeline, and waveform previews might be nice too. LiveMotion could also benefit from some simple audio editing functions, like the ability to do simple clip editing, and separately alter channels for stereo audio files. MP3 audio support also finds its way to version 2. Users can now import MP3s, as well as export streaming MP3 audio to both SWF and Quicktime output. I thought it was odd that version 1 omitted MP3 support, so this addition was a no-brainer. I truly love using After Effects, and my hope is that Adobe continues to develop LiveMotion into something just as powerful. If you are looking for a Web animation tool that offers an easy learning curve and works well with Illustrator and Photoshop files, LiveMotion is definitely worth checking out. This is also true if you are an After Effects user looking to serve interactive animations over the Web. LiveMotion 2 is quite a big step in the right direction, but probably not enough to sway a majority of current Flash users. However, with such major improvements seen in version 2, perhaps version 3 is the one that will surpass Flash.